Crossing the border from northern Thailand into Laos delivers you to the sleepy, riverside village of Huay Xai. While Huay Xai doesn’t have much to offer in the form of tourism it is the jumping off point for the Gibbon Experience. It’s best to arrive in town the night before you depart and there is no need to make hotel reservations in advance. Just wander up and down the one main street until you find something that works for you. There are 3 different experiences for you to choose from depending on your budget and length, I chose the 3 day, 2 night Classic Experience and was not disappointed. The Express Experience is 2 days, 1 night with more ziplining than hiking and the Waterfall Experience is 3 days, 2 nights with more strenuous hiking than the Classic. The first morning begins bright and early with check in at 8 am. If you forgot any last minute supplies to pack your daypack like a rain poncho during rainy season or just need to stock up on snacks you should do this before the meeting begins. Lunch is included once you arrive in the jungle but after hiking for about 2 hours the sandwich they provided wasn’t enough so I would recommend buying an extra sandwich or some other snacks at one of the shops before you leave. After a quick safety briefing on the zipline procedures it’s time to climb into the back of a truck and settle in for an hour and a half to two hour drive to the village at the base of the jungle. Once you arrive in the village, your guides will give you all a beer so that they don’t have to carry them for you and it’s up to you to choose when you drink it. Choose wisely! Half of our group chose to drink it before the hike and regretted it later while the other half carried it and then couldn’t drink it because it was beyond warm. Once we started the hike it became abundantly clear that it was going to be a hot and sweaty three days. I would recommend bringing two (or three depending on how hygiene conscious you are) quick drying shirts, insect repellant, a hiking hat, sunscreen for face and body and plenty of water. The treehouses have filtered water for refilling your bottle so just make sure you have enough for about 2-3 hours of heavy hiking. The hike was split by lunch and took us almost 2 hours to reach our treehouse. Along the way we were fitted with harnesses and helmets for the ziplining portion of our journey. While there are guides to help make sure you feel safe, you are pretty much left to your own devices on the zipline. It’s up to you to make sure you line is attached correctly and to get yourself stopped on the other side without barreling into a tree. Having a pair of simple fabric gloves makes it easier to enjoy zip lining! If you have a GoPro or any other kind of action camera make sure you bring it with you to capture the amazing view as you fly past the tops of the trees. 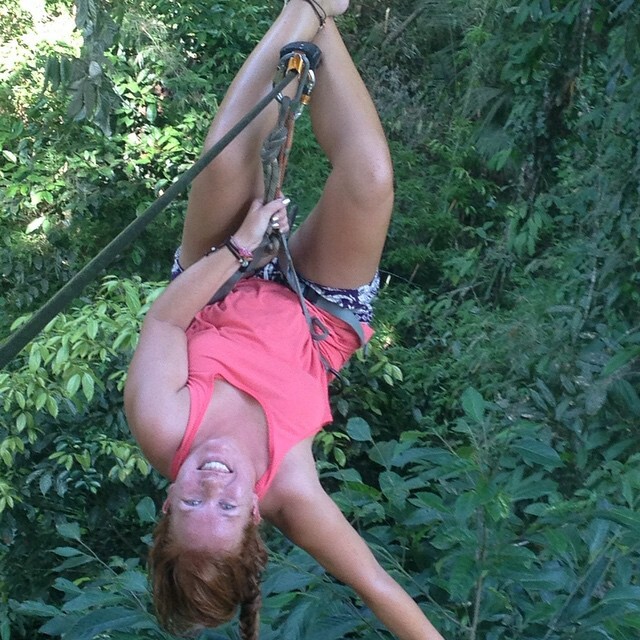 For your Go Pro I would also recommend to bring a chest or head mount to capture zip lining! And of course a monopod might be useful as well to make amazing selfies! After zipping into our treehouse and settling in our guide shared some information on the surrounding area and the animals we might come across. The biggest tip he gave us for spotting Gibbons is to be quiet. He did warn us that Gibbons had not been seen lately by our treehouse but there were by the other treehouses in previous days. When we asked how we would know if they were going to be out the next morning he just smiled and said “Oh you’ll know if they are out there. Trust me.” We finished off a filling dinner and waited for the sunset. When it’s your turn for the Gibbon Experience try and secure yourself a spot in Treehouse 7, it has by far the best views for sunset and for viewing the jungle as a whole. The treehouse can get a little chilly in the evenings so you might want to bring a light jacket (men, women) for after the sun sets but the blankets they provide are more than enough to keep you warm during the night. If you have a headlamp or torch (and extra batteries) it might come in handy in the evening but there are a few small lights on the treehouse for moving up and down the stairs. It also makes sense to grab a deck of playing cards! At around 5:30 the next morning we were woken up by what sounded like an extremely loud car alarm, which turned out to be the Gibbons. The best way to spot them is to start at the top of the tree line and look for movement in the trees. Once you’ve found something that looks like a little black or tan dot, pull out the binoculars and zoom in on these amazing creatures! We were lucky enough to see a whole family of 4 swinging down through the trees around us for about an hour and a half until they finally stopped in a tree about 150 meters from our treehouse. There are only 40 Gibbons currently living in the National Park area so if you actually get to see one consider yourself lucky! The remainder of day 2 was spent hiking and zipping through the jungle looking at all the other treehouses. Depending on which treehouse you end up sleeping in, it could be a long time between breakfast and lunch so take some snacks with you to help tide you over. Day 3 starts with a little bit of a sleep-in, unless you get woken up by the Gibbons again. This morning you have about an hour to zip around the platforms before it’s time to grab your gear and start the hike back to the village. The way back seems much easier because you are going mostly downhill this time. Once you arrive in the village, the trucks will be back to pick you up and you will stop for lunch before ending your experience. Few final tips, bring some antiseptic wipes, first aid kit, some toiletries and lots of soap because once you see the view from the shower you’ll never want to leave!